Is the Fermi gamma-ray excess evidence for dark matter or due to milli-second pulsars? The Large Area Telescope on board the Fermi spacecraft looks out for the most extreme events in the cosmos. 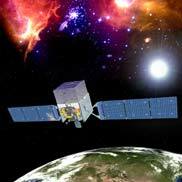 Launched 2008, it scans the whole sky for gamma rays in the very high energy range, from 20 MeV to about 300 GeV; a full scan takes about 3 hours. One of Fermi’s most interesting findings is an unexpectedly large amount of gamma-rays, ordinary light but at enormous energy, stemming from the center of our galaxy. The Fermi gamma-ray excess has proved difficult to explain with standard astrophysical processes. The spectral distribution of the observed gamma-rays over energies bulges at about 2 GeV and it is hard to come up with a mechanism that produces particles at such high energies that prefer this particular spectral feature. The other puzzle is that whatever the sources of the gamma-rays, they seem homogeneously distributed in the galactic center, out to distances of more than ten degrees, which is about 5,000 light years – a huge range to span. The most exciting proposal to solve the riddle is that the gamma-rays are produced by dark matter annihilation. Annihilation spectra often bulge at energies that depend on both the mass of the particles and their velocity. And the dark matter distribution is known to be denser towards centers of galaxies, so one would indeed expect more emission from there. While dark matter isn’t entirely homogeneous but has substructures, the changes in its density are small, which would result in an overall smooth emission. All of this fits very well with the observations. For this reason, many particle physicists have taken their dark matter models to see whether they can fit the Fermi data, and it is possible indeed without too much difficulty. If the Fermi gamma-ray excess was due to dark matter annihilation, it would speak for heavy dark matter particles with masses of about 30 to 100 GeV, which might also show up at the LHC, though nothing has been seen so far. Astrophysicists meanwhile haven’t been lazy and have tried to come up with other explanations for the gamma-ray excess. One of the earliest and still most compelling proposals is a population of millisecond pulsars. Such objects are thought to be created in some binary systems, where two stars orbit around a common center. When a neutron star succeeds in accreting mass from a companion star, it spins up enormously and starts to emit large amounts of particles including gamma rays reaching up to highest energies. This emission goes into one particular direction due to the rapid rotation of the system, and since we only observe it when it points at our telescopes the source seems to turn on and off in regular intervals: A pulsar has been created. Much remains to be understood about millisecond pulsars, including details of their formation and exact radiation characteristics, but several thousands of them have been observed so far and their properties are observationally well documented. Most of the millisecond pulsars on record are the ones in our galactic neighborhood. From this we know that they tend to occur in globular clusters where particularly many stars are close together. And the observations also tell us the millisecond pulsar spectrum peaks at about 2 GeV, which makes them ideal candidates to explain the Fermi gamma-ray excess. The only problem is that no such pulsars have been seen in the center of the galaxy where the excess seems to originate, at least so far. There are plausible reasons for this lack of observation. 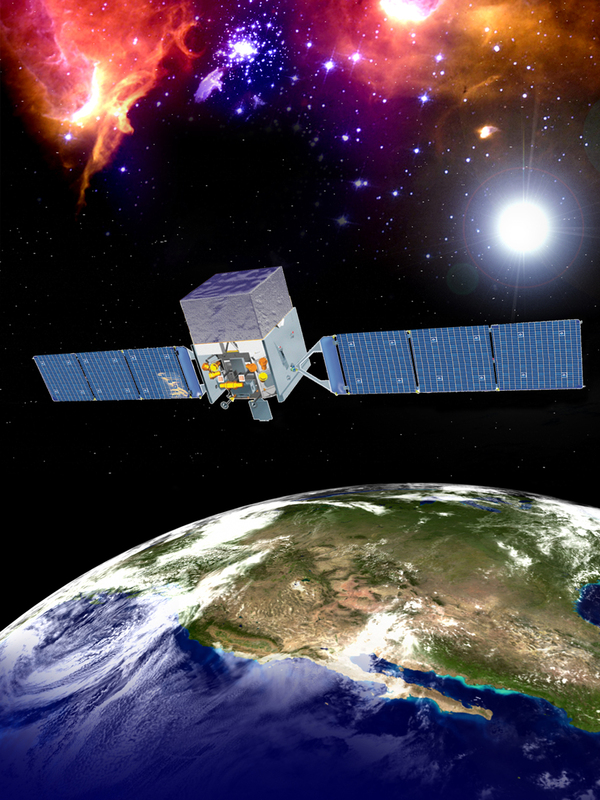 Millisecond pulsars tend to be detected in the radio range, at low energies. Only after astronomers have an idea of where exactly to look, they can aim precisely with telescopes to confirm the pulsation in the higher energy range. But such detections are difficult if not impossible in the center of the galaxy because observations are shrouded by electron gas. So it is quite plausible that the millisecond pulsars are in the center, they just haven’t been seen. Indeed, model-based estimates indicate that millisecond pulsars should also be present in the galactic center, as laid out for example in this recent paper. It would seem odd indeed if they weren’t there. On the other hand it has been argued that if millisecond pulsars were the source of the gamma-ray excess, then Fermi should also have been able to pinpoint a few of the pulsars in the galactic center already, which has not been the case. So now what? The relevant distinction between the both scenarios to explain the gamma ray excess, dark matter annihilation or millisecond pulsars, is whether the emission comes from point sources or whether the sources are indeed homogeneously distributed. This isn’t an easy question to answer because Fermi basically counts single photons and their distribution is noisy and inevitably sometimes peaks here or there just by coincidence. Making estimates based on such measurements is difficult and requires sophisticated analysis. In two recent papers now, researchers have taken a closer look at the existing Fermi data to see whether it gives an indication for point-like sources that have so far remained below the detection threshold beyond which they would be identified as stellar objects. For this they have to take the distribution of the measured signals, extract peaks ordered by magnitude, and test this measured distribution against a random distribution. The difference between these papers is the method they used to identify the point sources. The first paper by Bartels et al uses a wavelet analysis on the data, that is somewhat like a Fourier transform with a local profile, to pick up potential sources with low statistical significance. The Lee et al paper tries to generate a pattern close to the observed one by using various mixtures of noise and point sources of particular spectra. In both papers the researchers find that the data indicates the origin of the gamma-rays is point sources and not entirely smoothly distributed. In the first paper, the authors moreover extract the necessary density of pulsars in the galactic center to explain the observations, and demonstrate that it is possible the pulsars give rise to the observed excess and might so far have stayed just below the detection threshold for point sources. Taken together, it looks like the evidence has now shifted in favor of millisecond pulsars. As Christopher Weniger from the University of Amsterdam put it “[The pulsars] are there, we know they are there, and they have the right spectrum. We first have to rule out that this isn’t what we see.” Rather than ruling out astrophysical sources as origin of the gamma-ray excess however, the researchers are now well on the way to confirm it’s the pulsars that cause the signal. Finding definite evidence that the Fermi gamma-ray excess is due to millisecond pulsars is difficult but not impossible. What is needed is more statistics that will allow resolving the point sources better, and more time will bring more statistics. The puzzle isn’t solved yet, but chances are good it will be solved within the next years. What constitutes dark matter however at least for now remains a mystery. The number-crunchers. How we learned to stop worrying and love to code. My grandmother was a calculator, and I don’t mean to say I’m the newest from Texas Instruments. I mean my grandmother did calculations for a living, with pencil on paper, using a slide rule and logarithmic tables. She calculated the positions of stars on the night sky, for five minute intervals, day by day, digit by digit. Today you can download one of a dozen free apps to display the night sky for any position on Earth, any time, any day. Not that you actually need to know stellar constellations to find True North. Using satellite signals, your phones can now tell your position to within a few meters, and so can 2 million hackers in Russia. My daughters meanwhile are thoroughly confused as to what a phone is, since we use the phone to take photos but make calls on the computer. For my four-year old a “phone” is pretty much anything that beeps, including the microwave, which for all I know by next year might start taking photos of dinner and upload them to facebook. And the landline. Now that you say it. Somebody called in March and left a voicemail. Jack Myers dubbed us the “gap generation,” the last generation to remember the time before the internet. Myers is a self-described “media ecologist” which makes you think he’d have heard of search engine optimization. Unfortunately, when queried “gap generation” it takes Google 0.31 seconds to helpfully bring up 268,000,000 hits for “generation gap.” But it’s okay. I too recall life without Google, when “viral” meant getting a thermometer stuffed between your lips rather than being on everybody’s lips. I wrote my first email in 1995 with a shell script called “mail” when the internet was chats and animated gifs. Back then, searching a journal article meant finding a ladder and blowing dust off thick volumes with yellowish pages. There were no keyword tags or trackbacks; I looked for articles by randomly browsing through journals. If I had an integral to calculate, there were Gradshteyn and Ryzhik’s tables, or Abramovitz and Stegun's Handbook of Special Functions, and else, good luck. Our first computer software for mathematical calculations, one of the early Maple versions, left me skeptical. It had an infamous error in one of the binomial equations that didn’t exactly instill trust. The program was slow and stalled the machine for which everybody hated me because my desk computer was also the institute’s main server (which I didn’t know until I turned it off, but then learned very quickly). I taught myself fortran and perl and java script and later some c++, and complained it wasn’t how I had imagined being a theoretical physicist. I had envisioned myself thinking deep thoughts about the fundamental structure of reality, not chasing after missing parentheses. We say an integral is solved if we can write it down as a composition of known functions. But this selection of functions, even the polynomials, are arbitrary choices. Why not take the supposedly unsolvable integral, use it to define a function and be done with it? Why are some functions solutions and others aren’t? We prefer particular functions because their behaviors are well understood. But that again is a matter of how much they are used and studied. Isn’t it in the end all a matter of habit and convention? After two years I managed to renormalize the damned integral and was left with an expression containing incomplete Gamma functions, which are themselves defined by yet other integrals. The best thing I knew to do with this was to derive some asymptotic limits and then plot the full expression. Had there been any way to do this calculation numerically all along, I’d happily have done it, saved two years of time, and gotten the exact same result and insight. Or would I? I doubt the paper would even have gotten published. Twenty years ago, I like most physicists considered numerical results inferior to analytical, pen-on-paper, derivations. But this attitude has changed, changed so slowly I almost didn’t notice it changing. 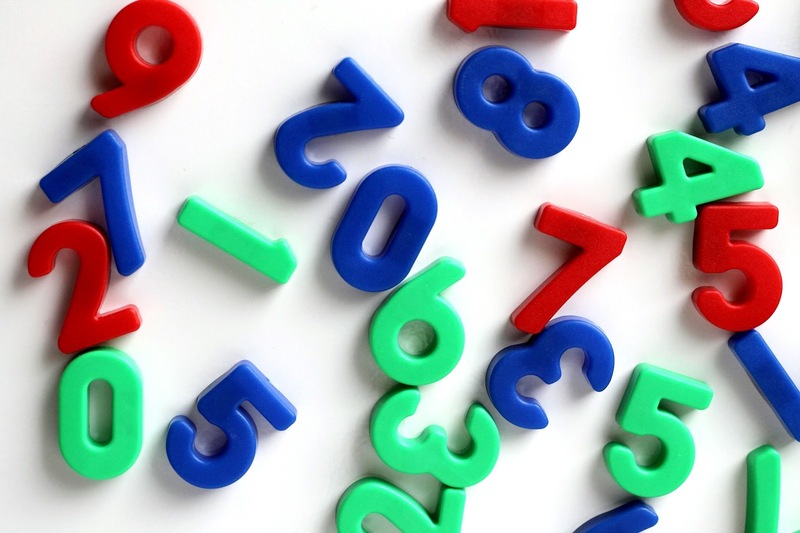 Today numerical studies are still often considered suspicious, fighting a prejudice of undocumented error. But it has become accepted practice to publish results merely in forms of graphs, figures, and tables, videos even, for (systems of) differential equations that aren’t analytically tractable. Especially in General Relativity, where differential equations tend to be coupled, non-linear, and with coordinate-dependent coefficients – ie as nasty as it gets – analytic solutions are the exception not the norm. Numerical results are still less convincing, but not so much because of a romantic yearning for deep insights. They are less convincing primarily because we lack shared standards for coding, whereas we all know the standards of analytical calculation. We use the same functions and the same symbols (well, mostly), whereas deciphering somebody else’s code requires as much psychoanalysis as patience. For now. But imagine you could check code with the same ease you check algebraic manipulation. Would you ditch analytical calculations over purely numerical ones, given the broader applicability of the latter? How would insights obtained by one method be of any less value than those obtained by the other? The increase of computing power has generated entirely new fields of physics by allowing calculations that previously just weren’t feasible. Turbulence in plasma, supernovae explosion, heavy ion collisions, neutron star mergers, or lattice qcd to study the strong nuclear interaction, these are all examples of investigations that have flourished only with the increase in processing speed and memory. Such disciplines tend to develop their own, unique and very specialized nomenclature and procedures that are difficult if not impossible to evaluate for outsiders. The maybe best example is miniscule corrections to probabilities of scattering events, like those taking place at the LHC. Calculating these next-to-next-to-next-to-leading-order contributions is an art as much as a science; it is a small subfield of high energy physics that requires summing up thousands or millions of Feynman diagrams. While there are many software packages available, few physicists know all the intricacies and command all the techniques; those who do often develop software along with their research. They are perfecting calculations, aiming for the tiniest increase in precision much like pole jumpers perfect their every motion aiming after the tiniest increase in height. It is a highly specialized skill, presently at the edge of theoretical physics. But while we admire the relentless perfection of professional athletes, we disregard the single-minded focus of the number-crunchers. What can we learn from it? What insight can be gained from moving the bar an inch higher? What insight do you gain from calculating the positions of stars on the night sky, you could have asked my grandmother. She was the youngest of seven siblings, her father died in the first world war. Her only brother and husband were drafted for the second world war and feeding the family was left to the sisters. To avoid manufacturing weapons for a regime she detested, she took on a position in an observatory, calculating the positions of stars. This appointment came to a sudden stop when her husband was badly injured and she was called to his side at the war front to watch him die, or so she assumed. Against all expectations, my grandfather recovered from his skull fractures. He didn’t have to return to the front and my grandma didn’t return to her job. It was only when the war was over that she learned her calculations were to help the soldiers target bombs, knowledge that would haunt her still 60 years later. What insight do we gain from this? Precision is the hallmark of science, and for much of our society science is an end for other means. But can mere calculation ever lead to true progress? Surely not with the computer codes we use today, which execute operations but do not look for simplified underlying principles, which is necessary to advance understanding. It is this lacking search for new theories that leaves physicists cynical about the value of computation. And yet some time in the future we might have computer programs doing exactly this, looking for underlying mathematical laws better suited than existing ones to match observation. Will physicists one day be replaced by software? Can natural law be extracted by computers from data? If you handed all the LHC output to an artificial intelligence, could it spit out the standard model? His future vision was widely criticized by physicists, me included, but I’ve had a change of mind. Much of the criticism Anderson took was due to vanity. We like to believe the world will fall into pieces without our genius and don’t want to be replaced by software. But I don’t think there’s anything special about the human brain that an artificial intelligence couldn’t do, in principle. And I don’t care very much who or what delivers insights, as long as they come by. In the end it comes down to trust. If a computer came up with just the right string theory vacuum to explain the standard model and offered you the explanation that the world is made of strings to within an exactly quantified precision, what difference would it make whether the headline was made by a machine rather than a human? Wouldn’t you gain the exact same insight? Yes, we would still need humans to initiate the search, someone to write a code that will deliver to our purposes. And chances are we would celebrate the human, rather than the machine. But the rest is overcoming prejudice against “number crunching,” which has to be addressed by setting up reliable procedures that ensure a computer’s results are sound science. I’ll be happy if your AI delivers a theory of quantum gravity; bring it on. My grandmother outlived her husband who died after multiple strokes. Well in her 90s she still had a habit of checking all the numbers on her receipts, bills, and account statements. Despite my conviction that artificial intelligences could replace physicists, I don’t think it’s likely to happen. The human brain is remarkable not so much for its sheer computing power, but for its efficiency, resilience, and durability. You show me any man-made machine that will still run after 90 years in permanent use. Book review: “Eureka” by Chad Orzel. It’s a good book, really. The problem isn’t the book, the problem is me. 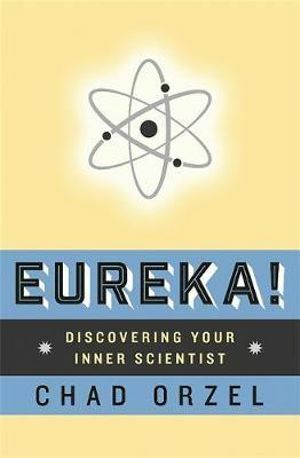 Chad Orzel’s new book “Eureka” lays out how the scientific enterprise reflects in every-day activities. In four parts, “Look, Think, Test, Tell,” Chad connects examples from sports, cooking, collecting, crossword puzzles, mystery novels, and more, to the methodology used in scientific discovery. Along the way, he covers a lot of ground in astrophysics, cosmology, geology, and atomic physics. And the extinction of the dinosaurs. It’s a well-written book, with relevant but not excessive references and footnotes; the scientific explanations are accurate yet non-technical; the anecdotes from the history of science and contemporary academia are nicely woven together with the books theme, that every one of us has an “inner scientist” who is waiting to be discovered. To my big relief in this recent book Chad doesn’t talk to his dog. Because I’m really not a dog person. I’m the kind of person who feeds the neighbor’s cat. Sometimes. I’m also the kind of person who likes baking, running, house music, and doesn’t watch TV. I order frozen food and get it delivered to the door. Chad cooks, believes baking is black magic, plays basketball, likes rock music, and his writing draws a lot on contemporary US TV shows or movies. He might be a good science popularizer, but his sports popularization is miserable. It doesn’t seem to have occurred to him that somebody could read his book who, like me, doesn’t know anything about baseball, or bridge, or basketball, and therefore much of his explanations are entirely lost on me. I don’t think I’ve ever read a book that made me feel so distinctly that I’m not the intended audience. Of course the whole idea of “Eureka” is totally backwards for me. You don’t have to convince me I’m capable of scientific reasoning. I have even proved capable of convincing others I’m capable of scientific reasoning. Sometimes. But I do not have the slightest idea why somebody would want to spend hours trying to throw a ball into a basket, or, even more bizarre, watch other people trying to throw balls into baskets. So some stretches of the book stretched indeed. Which is why it’s taken me so long to get through with it, since I had an advance proof more than a year ago. Besides this, I have a general issue with the well-meant message that we were born to think scientifically, as I elaborated on in this recent post. Chad’s argument is that every one of us brings the curiosity and skills to be a scientist, and that we use many of these skills intuitively. I agree on this. Sometimes. I wish though that he had spent a few more words pointing out that being a scientist is a profession after all, and one that requires adequate education for a reason. While we do some things right intuitively, intuition can also mislead us. I understand that Chad addresses an existing cultural misconception, which is that science is only for a gifted few rather than a general way to understand the world. However, I’d rather not swap this misconception for another misconception, which is that scientific understanding comes with little guidance and effort. In summary, it’s a great book to give to someone who is interested in sports but not in science, to help them discover their inner scientist. Chad does an excellent job pointing out how much scientific thought there is in daily life, and he gets across a lot of physics along with that. He tells the reader that approaching problems scientifically is not just helpful for researchers, but for every one to understand the world. Sometimes. Now somebody please explain me the infield fly rule. Few myths have been busted as often and as cheerfully as that of the lone genius. “Future discoveries are more likely to be made by scientists sharing ideas than a lone genius,” declares Athene Donald in the Guardian, and Joshua Wolf Shenk opines in the NYT that “the lone genius is a myth that has outlived its usefulness.” Thinking on your own is so yesterday; today is collaboration. “Fortunately, a more truthful model is emerging: the creative network,” Shenk goes on. It sounds scary. Science Watch keeps tracks of the data. The average number of authors per paper has risen from 2.5 in the early 1980s to more than five today. 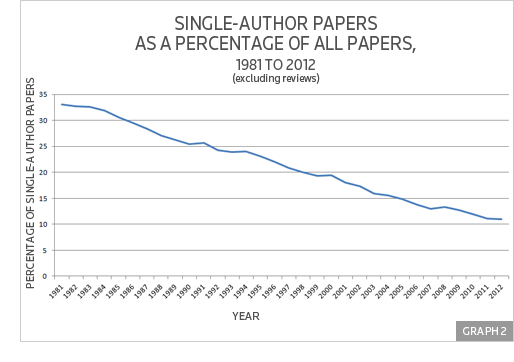 At the same time, the fraction of single authored papers has declined from more than 30% to about 10%. Part of the reason for this trend is that the combination of expertise achieved by collaboration opens new possibilities that are being exploited. This would suggest that the increase is temporary and will eventually stagnate or start declining again once the potential in these connections has been fully put to use. But I don’t think the popularity of larger collaborations is going to decline anytime soon, because for some purposes one paper with five authors counts as five papers. If I list a paper on our institutional preprint list, nobody cares how many coauthors it has – it counts as one more paper, and my coauthors’ institutions can be equally happy about adding a paper to their count. If you work on the average with 5 coauthors and divide up the work fairly, your publication list will end up being five times as long as if you’d be working alone. The logical goal of this accounting can only be that we all coauthor every paper that gets published. So, have the numbers spoken and demonstrated the lone genius is no more? Well, most scientists aren’t geniuses and nobody really agrees what that means anyway, so let us ask instead what happened to the lone scientists. The “lone scientist” isn’t so much a myth than an oxymoron. Science is ultimately a community enterprise – an idea not communicated will never become accepted part of science. But the lone scientist has always existed and certainly still exists as a mode of operation, as a step on the path to an idea worth developing. Declaring lonely work a myth is deeply ironic for the graduate student stuck with an assigned project nobody seems to care about. In theoretical physics research often means making yourself world expert on whatever topic, whether you picked it for yourself or whether somebody else thought it was a good idea. And loneliness is the flipside of this specialization. That researchers may sometimes be lonely in their quest doesn’t imply they are alone or they don’t talk to each other. But when you are the midst of working out an idea that isn’t yet fully developed, there is really nobody who will understand what you are trying to do. Possibly not even you yourself understand. We use and abuse our colleagues as sounding boards, because attempting to explain yourself to somebody else can work wonders to clarify your own thoughts, even though the person doesn’t understand a word. I have been both at the giving and receiving end of this process. A colleague, who shall remain unnamed, on occasion simply falls asleep while I am trying to make sense. My husband deserves credit for enduring my ramblings about failed calculations even though he doesn’t have a clue what I mean. And I’ve learned to listen rather than just declaring that I don’t know a thing about whatever. So the historians pointing out that Einstein didn’t work in isolation, and that he met frequently with other researchers to discuss, do not give honor to the frustrating and often painful process of having to work through a calculation one doesn’t know how to do in the first place. It is evident from Einstein’s biography and publications that he spent years trying to find the right equations, working with a mathematical apparatus that was unfamiliar to most researchers back then. There was nobody who could have helped him trying to find the successful description that his intuition looked for. Not all physicists are Einstein of course, and many of us work on topics where the methodology is well developed and widely shared. But it is very common to get stuck while trying to find a mathematically accurate framework for an idea that, without having found what one is looking for, remains difficult or impossible to communicate. This leaves us alone with that potentially brilliant idea and the task of having to sort out our messy thoughts well enough to even be able to make sense to our colleagues. At least for now we’re all alone in our heads. And as long as that remains so, the scientist struggling to make sense alone will remain reality. I have recently begun working on a research topic entirely new for me. The idea is to combine analog gravity with the applications of the gauge-gravity duality to condensed matter systems. Two ingredients are necessary for this: First, there is the AdS/CFT duality that identifies a gravitational system in asymptotic anti-de Sitter (AdS) space-time with a conformal field theory on the boundary of that space. And second, there is analog gravity, which is the property of some weakly coupled condensed matter systems to give rise to an effective metric. Combine both, and you obtain a new relation, “analog duality,” that connects a strongly coupled with a weakly coupled condensed matter theory, where the metric in AdS space plays the role of an intermediary. I have now given several seminars about this, and the most common reaction I get is “Why hasn’t anybody done this before?” Well, I don’t know! It might sound obvious, but it isn’t all that trivial once you look at the details. For this junction of two different research directions to work, you have to show that it is indeed possible to obtain the metrics used in the gauge-gravity applications as effective metrics in analog gravity. The gauge-gravity duality (left) identifies some solutions in General Relativity with strongly coupled condensed matter systems. Analog gravity (right) identifies some solutions in General Relativity with effective metrics of certain types of weakly coupled condensed matter systems. Provided one can show that the set of metrics used in the gauge-gravity duality overlaps with the set of metrics used in analog gravity, one obtains a new relation, “analog duality,” between strongly and a weakly coupled condensed matter systems. Concretely, for the applications of the gauge-gravity duality to condensed matter systems people do not use the full mathematical apparatus of this correspondence. To begin with they only work in the limit where in the AdS space one has only classical gravity, and some fields propagating in it, but no string effects. And they are not using a system that is known to correspond to any well-understood theory on the boundary. These are phenomenological models, which is why I find this research area so appealing. Mathematical beauty is nice, but for me describing reality scores higher. For the phenomenological approach one takes the general idea to use a gravitational theory to describe a condensed matter system, and rather than trying to derive this from first principles, sees whether it fits with observations. In my paper, what I have done is to look at the metrics that are being used to describe high temperature superconductors, and have shown that they can indeed be obtained as effective metrics in certain analog gravity systems. To prove this, one first has to convert the metric into a specific form, which amounts to a certain gauge condition, and then extract the degrees of freedom of the fluid. After this, one has to show that these degrees of freedom fulfil the equations of motion, which will not in general be the case even if you can bring a metric into the necessary form. Amazingly enough, this turned out to work very well, better indeed than I expected. The coordinate systems commonly used in the AdS/CFT duality have the metric already in almost the right form, and all one has to do is to apply a little shear to it. If one then extracts the degrees of freedom of the fluid, they quite mysteriously fulfil the equations of motion automatically. The challenge in that wasn’t so much doing the calculation but to find out how to do it in the first place. I found this connection really surprising. The metrics are derived within classical General Relativity. They are solutions to a set of equations that know absolutely nothing about hydrodynamics; it’s basically Maxwell’s equations in a curved background with a cosmological constant added. But once you have learned to look at this metric in the right way, you find that it contains the degrees of freedom of a fluid! And it is not the fluid on the boundary of the space-time that belongs to the gauge-theory, but a different one. This adds further evidence to the connection between gravity and hydrodynamics that has been mounting for decades. One then has two condensed matter systems describing aspects of the same gravitational theory, which gives rise to relations between the two condensed matter systems. It turns out for example that the temperature of the one system (on the boundary of AdS) is related to the speed of sound of the other system. There must be more relations like this, but I haven’t yet had the time to look into this in more detail. As always, there is some fineprint that I must mention. It turns out for example that both the analog gravity system and the boundary of the AdS space must have dimension 3+1. This isn’t something I got to pick; the identification only works in this case. This means that the analog gravity system describes a slice of AdS space, but unlike the boundary it’s a slice perpendicular to the horizon. The more relevant limitation of what I have so far is that in general the equations of motion for the background of the fluid in the analog gravity system will not be identical to Einstein’s field equations. This means that at least for now I cannot include backreaction, and the identification only works on the level of quantum field theory in a fixed background. I have also in the present paper worked only in a non-relativistic limit, which is a consistent approximation and fine to use, but if the new relation is to make sense physically there must be a fully relativistic treatment. The relativistic extension is what I am working on right now, and while the calculation isn’t finished yet, I can vaguely say it looks good. So I’m still several steps away from actually proving that a new duality exists, but I have shown that several necessary conditions required for its existence are fulfilled, which is promising. Now suppose I’d manage to prove in generality that there is a new duality that can be obtained by combining the gauge-gravity duality with analog gravity, what would it be good for? To begin with, I find this interesting for purely theoretical reasons. But beyond this, the advantage of this duality over the gauge-gravity duality is that both systems (the strongly and the weakly coupled condensed matter system) can be realized in the laboratory. (At least in principle. I have a Lagrangian, but not sure yet exactly what it describes.) This means one could experimentally test the validity of this relation by comparing measurements on both systems. Since the gauge-gravity applications to condensed matter systems were indirectly used to obtain the new duality, this would then serve as an implicit experimental test for the validity of the AdS/CFT duality in these applications. A year ago, I knew very little about any of the physics involved in this project. I’ve never before worked on AdS/CFT, analog gravity, magnetohydrodynamics, or superconductivity, and this is all still very new for me. It’s been a steep learning curve, and I am nowhere near having the same overview on this research than I have on quantum gravity phenomenology – there I’ve reached a level where it feels like I’ve seen it all before. I’m not good with planning ahead my research because I tend to go where my interest takes me, but I think I’ll stick around with this topic and see how far I can push this idea of a new duality. I definitely want to see if I can make the case with backreaction work, at least in the simplest scenarios. and I have slides of my talk here.